The Kalphite Queen is a Kalphite Boss found within the Kalphite Lair south of Shantay Pass. As the Kalphite Queen is a Kalphite, she can be successfully killed on a Kalphite slayer task as well as a Kalphite Queen boss task. The Kalphite Queen was one of the earliest bosses to be added to the game. It was often killed by players who were hunting the famed Dragon Chainbody, however, players nowadays often kill the Kalphite Queen for the chance at the Kalphite Queen Head, which allows you to re-colour the slayer helm to green, and also the Kalphite pet. One of the easiest ways to kill the Kalphite Queen, especially in groups is to use Veracs. This is due to Verac’s ability to hit through prayer. Using Veracs at the Kalphite Queen is fairly simple. You simply need to use the Protection from Magic prayer and kill her as fast as possible. 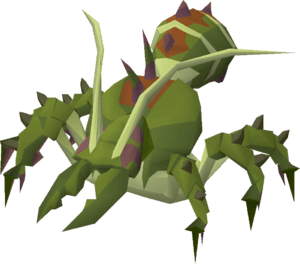 The Kalphite Queen has two phases, the first phase uses two prayers – Protection from Magic and Protection from Missiles, meaning melee is really the only viable method for this Phase. During Phase two, the Kalphite Queen uses the Protection from Melee prayer, meaning you would normally switch to Ranged or Magic gear, but as Veracs allows you to hit through prayer you can utilise Veracs for both phases. You can utilize the ‘step under’ technique in order to take less hits from the Kalphite Queen. What you should do is hit her twice, then immediately run under her so that she is unable to attack you until one of you move. This will give you a couple of seconds to eat if you need to, and then jump out from under her and immediately return to attacking. Your Rune Pouch should contain Runes for the Vengeance spell, in order to increase your DPS. You can swap out the Dragon Warhammer for a similar Special Attack weapon, like a Bandos Godsword.